My previous post reminded me of a couple of other things Burgundian. A few years ago, I was fortunate enough to pick up a hardback copy of the 1962 edition of this book by Joseph Calmette for a couple of pounds. 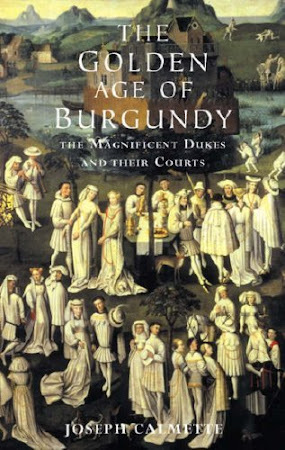 It presents not only a full history of the Dukes of Burgundy but an interesting, and uncommon, view of the Hundred Years War: not French, not English but Burgundian. Of course the book also covers Charles' defeats to the Swiss in some detail. It's a good book and you can judge for yourself as there are sample pages available free online via Amazon; just click on the cover above. I recommend this to anyone interested in the history of medieval Burgundy. This panorama, painted in 1893 by Louis Braun, formed part of the 2002 Swiss National Expo and was made available online in the same year as a demonstration of what "new media" could do. Well worth a visit but a word of warning the panorama doesn't work with Firefox 2 or 3 but works fine with Internet Explorer 7.